To sign up for a class, you can email or text me and pay via email or stop by with a cheque etc. The classes are very small (max 4 people) so if you want to get a spot its a good idea to let me know :) The studio is in Cowichan Bay in my home and my contact information is below for all the details. The studio is humming along this time of year. Classes are running and gardens are getting plenty of attention and sunshine. I am very happy with the Imagine That! Gallery downtown and will be regularly stocking my space there with fresh work:) I have a big hike planned with my awesome sister in June to look forward to and train for. 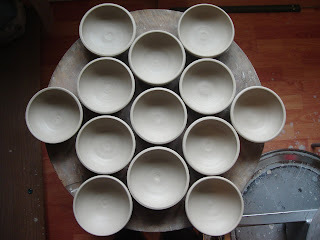 But, for now, I need to get back into the studio and trim yesterdays huge mugs and pull some handles--then i need to make a fresh 20kg batch of my earthy green glaze. I have fired all the Feb/March student work that was glazed but I still have to get another bisque in there to finish their last pieces before I glaze it all! Our open/drop in glaze nights were fun and all but one person was able to find some time to drop in and finish things up. You are all very clever and can figure it out! We are still working on the July and August Classes and I will post them when they are ready:) I am considering an intense workshop style project so if you have any ideas you would like to explore -fire them over to me!